I love the Autism Positivity Project. Too often the negative attributes of Autism are highlighted and the positive things that Autism has brought to us pushed aside. Autism may have it’s challenges but the people who have Autism are beautiful, caring, compassionate, intelligent, honest, driven, and amazing individuals. As a parent my greatest fears are that my Monkey will be perceived as different, not accepted, and that he will therefore suffer heartache because of this. I hope that by the time my Monkey is an adult there will be a more positive outlook on autism but until that day comes I will continue to build his confidence by reminding him of how amazing he is and all the wonderful things he can do. I always tell him that he can be whatever he wants to be when he grows up regardless of Autism and I truly believe this. Rebecca and I decided that for our Autism Positivity Post that we would highlight how autism has positively affected us and what our Ausome children are doing. For me as a parent, autism has taught me how to be more concrete in everything I do. It has helped me on the job, as I spend more time when giving instructions for a project. I find I now give more detailed step, by step instructions. It has taught me that there are many different ways to see the same thing – and that it’s not that one is right or wrong, they are just different. Autism has taught me to be more aware of challenges that others may be facing, and be more accommodating on a day-t0-day basis from work to social gatherings. MJ learned how to use the bathroom by being taught how her body worked. She learned how to open a door by showing her how doorknobs and door jambs work. She is opening my eyes to a whole different way of learning and seeing life. She will often come out with these simple off-handed comments that describe how something feels or seems to her. For example, with her acid reflux, she’ll look at you and say – it feels like my stomach has switched places with my throat. Or when she’s anxious, that the blood is racing through her body and trying to escape through her ears. She’s not even 5 yet – these are amazingly visual concepts that she has put together that instantly allow me to understand how she is feeling in the moment. I say it in my bio, and I will say it again, most days, I feel like my daughter teaches me more than I teach her. For me, as a parent, autism has taught me patience. It has made me realize that everyone learns at a different pace and that some things just can not be rushed. My Monkey has taught me that there is a different way to see the world and that if we pay attention long enough we just might see something unexpected along the way. Life with autism can sometimes be hard and frustrating but once we adapt ourselves to learn in the way in which our children do the good days far out weigh the bad ones. I am most proud of my Monkey’s eagerness to learn and to absorb knowledge. He has a passion to learn and to understand the world which is far beyond the typical interests of a child that is 5 and that is something to be amazed at. I know that he has social ticks which may hinder him in the future but I know that he will continue to amaze us. Currently the Monkey has a hard time articulating emotions to us or understanding what he is feeling but I look forward to the day when he might be able to tell me in his own words what it is like to be inside his head. 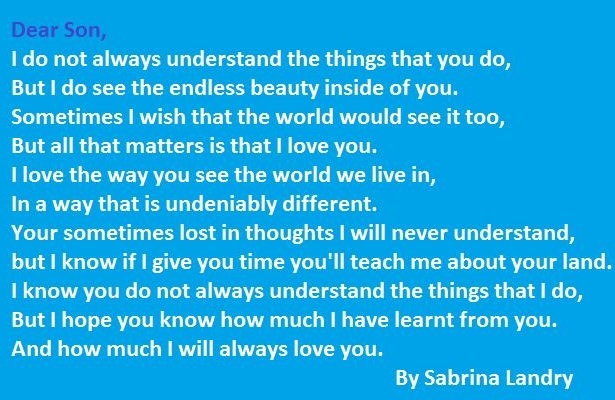 Lastly I wanted to share a poem I wrote recently for my son. He is my driving force and he amazes me everyday I just hope he knows how much I love him. If you have not yet done so but wish to participate in the Flash Blog click here. It will take you to the sites post that explains all the steps to take.